Their parents drove them on their first date 17 years ago when they were sophomores at Catalina Foothills High School. Aaron and Stephanie couldn’t recall, though, if they went to the arcade or to the movies. After graduating from the University of Arizona, Stephanie went to graduate school in St. Louis, where she earned her Doctorate of Physical Therapy. Aaron headed to Washington D.C. to serve as the youngest press secretary for Senator Charles Schumer and others. 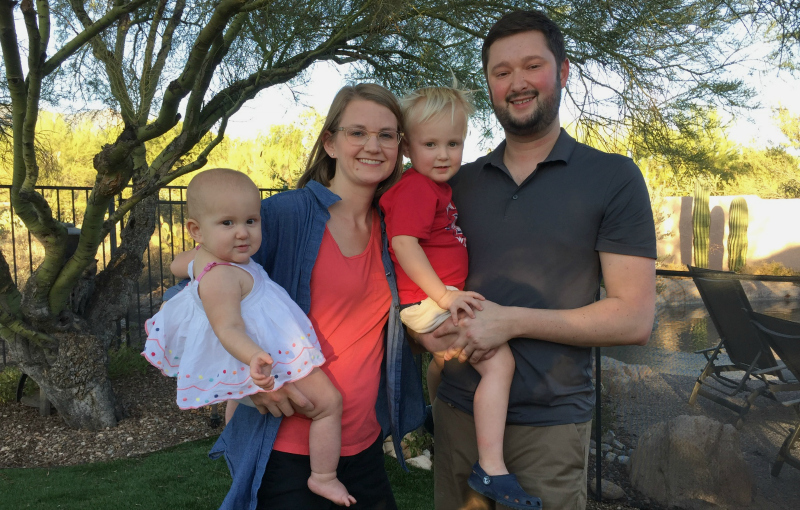 “The second I arrived in D.C., I was figuring out how to get back to Tucson,” says Aaron, who, at the time, figured going home would have to wait until he and Stephanie were in their 40s or 50s. It hit them very quickly, however, that they didn’t want to wait. They drove back to Tucson six years ago with the intention of investing in their hometown and making it an even better place to live, work and raise children. Both Aaron and Stephanie are passionate about making a difference. Aaron is a Jewish Community Foundation of Southern Arizona board member and Stephanie serves on the Women’s Foundation of Southern Arizona board of directors. They are both involved with Social Venture Partners Tucson. Wanting to support the community with both their energy and their pocket books, they opened a Donor Advised Fund at JCF, which helps the couple keep their giving focused and strategic. They hope to instill their values in their children; Ezra is two and Alice is nearly a year old. Ezra joins Stephanie at Children’s Clinics events, where she directs the rehabilitation department and recently started an Adaptive Recreation Program. Through the generosity of the program’s nonprofit funder, Children’s Clinics gave away 100 bikes adapted for their clients last year and are on target to give away even more this year. Being involved in community foundation work gives them both a broad perspective on philanthropy and the importance of making a difference in new and creative ways. Both Stephanie and Aaron talk to Ezra about their work in terms of helping people and serving the greater good. Aaron is an Account Vice President with UBS Wealth Management and Consulting. He works together with his dad, Myron, and enjoys creating meaningful experiences for people, noting that donors interested in legacy giving often give sooner because they want to see results in their lifetimes. Aaron says that when he was growing up in Tucson in the 1990s, the city was an exciting place. “The Toros were winning, boy bands were the rage, and Park Mall was booming,” he jokes. When the recession hit, that excitement was lost but Aaron now sees Tucson coming back and becoming the kind of city where he, his family, and his peers can create and build a community where young people stay, grow and prosper.